The Empowered Mindset is a series that dives deep into some of life’s most pressing financial topics. The goal? To help you develop a framework for making money decisions that work for you. This series is dedicated to getting you into the driver’s seat of your financial future. Though they don’t always feel relevant until we need them, debt and credit are a part of our lives — whether we pay attention to them or not. That’s why it’s so important to understand how to manage debt and credit before they manage us. Think you don’t need debt? Even if you never take out a credit card in your life, chances are you’ll need credit to pay for a house or car — or have already started dealing with debt through student loans. And that’s not inherently bad. The only time these financial tools become a problem is when they spin out of our control. So, let’s discuss how to handle debt and credit in a way that will enable you to achieve your goals today, tomorrow, and well into the future. Before we talk about debt, let’s talk about credit. Credit is essentially what you need to get debt. It’s how lenders determine whether you will pay off your debt on time. Having good credit means you are less risky to lend to, and what lender wouldn’t want that! Having good credit means you are a sought after borrowers, and when used correctly, could translate to getting a favorable interest rate, having a lower monthly payment and paying off your debt faster. Unfortunately, credit is probably one of the most misunderstood financial topics out there. By nature, credit is a pretty simple thing, but there a lot of myths floating around about “credit hacks” that can be pretty damaging to your finances. Therefore, even if you think you know a lot about credit, it’s important to start with the basics. … and a credit report does not show you your credit score. Credit reports are generated by three credit reporting bureaus: Equifax, Experian, and TransUnion, and they show information such as your open and closed accounts, your payment history, your address and social security number, and more. FICO (the original and still most used) and VantageScore (the newbie that’s growing in popularity). Since there is more than one credit score company, and each company has multiple models of their scores, we all automatically have multiple credit scores. Due to the fact that there are multiple credit scores for each of us, it doesn’t pay to try to obtain a “perfect” credit score. Instead, it’s better to focus on the credit score range our scores fall into. It’s worth repeating: the multitude of scores should free you from the notion of needing to get a perfect score. Since there is more than one credit score, and different scores come from different formulas, then your individual scores can vary from one another. There are also industry-specific credit scoring models. This includes scores for mortgages, auto loans, and more. Lenders can also utilize their own formulas on top of these models. Although credit scores aren’t shown on your credit report, there are various places to view one of your credit scores for free. Now even many banks and credit cards show their customers a version of their score. Now that those basic facts are out of the way, let’s move on to the things that factor into your credit scores. 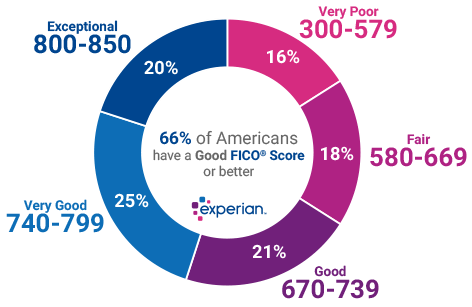 As you can see from the charts above, it’s ideal to aim for a credit score of 750 and above. And the thing to care about most is your payment history. This is good news, because as long as you pay all of your bills on time each month, then you’re already doing the work of building and maintaining a good credit score. The other important factor is to keep your balances low on revolving credit accounts (credit cards and lines of credit). The amount you owe in comparison to your available credit is called the “credit utilization” rate or ratio — and a ratio of 30 percent or less is recommended. And if you can keep it at zero percent, all the better (that means having active credit cards, but paying off the balances each month). Finally, the age of your accounts impacts your score and can be an easy factor to maintain. Simply keep old accounts open and let them benefit your credit score. Credit Myth #1: You must maintain a balance on your credit card to build credit. This is patently false. Having a credit card can be good for your score, as can using it — but carrying a balance from month to month doesn’t give you anything but debt. Remember the point on credit utilization ratios: The ideal ratio is to not owe more than 30 percent of your total credit limits. But the best ratio you can get is zero. If you really want to use a credit card to build credit, then go ahead and swipe it, but pay off the balance each month. That way you can build credit and avoid debt. Credit Myth #2: If you apply for a bunch of credit at one time, your score will take a major hit. It’s true that credit applications result in a “hard inquiry” on your credit report, and that you can lose a few points on your score when that happens. The thing is, a couple of points out of a score in the triple digits really doesn’t amount to much. In other words, they’ll see that you’re not trying to get all of those loans, but rather the one with the best interest rate and terms. Therefore, they bundle those applications into one hard inquiry. This both protects your score and enables you to find the best deal you can get. Now, if you apply for a mortgage and an auto loan and a credit card (or a few of each), your credit score will take a hit. The moral of the story is: Prioritize. Credit Myth #3: Checking your credit score hurts your score. Also not true. Checking your credit score does not result in a hard inquiry. Therefore, you can and should check it to your heart’s content. Just know that the score you see might be what’s called an “educational score,” which is developed to show you where you stand — but it’s not necessarily the score lenders see. This is one more reason it makes the most sense to pay attention to your credit score range and not the exact score itself. On this same note, when companies send you pre-qualification letters for credit, or when you apply for pre-approvals, what’s happening is a “soft inquiry.” This won’t damage your score and, again, enables rate shopping. When you find the best offer for you and do a full application for it beyond the pre-approval stage, then a hard inquiry will result. Unlike credit, which can feel complicated at times, debt is a fairly straightforward topic. What gets messy, however, is the emotional response this topic can bring on. Ask ten people you know if they think debt is “good” or “bad,” and you’re almost guaranteed to get several different reactions. Given the fact that many are drowning in a sea of debt thanks to student loans and difficult-to-pay-off credit cards, it makes sense that many people hate debt with the fire of a thousand suns. Debt is a tool. And, just like power tools, proper usage of debt requires care, maintenance, and safety precautions — without which it can become very dangerous. At its core, debt can be useful. Very few people can afford to buy a home in cash, for example. The problem is that it’s easy to get in over our heads — and we can’t count on lenders to help us stay within our means. After all, their goal is to make money, and that can mean lending you more money that they can charge interest on. The next time a lender tells you what you can “afford,” do the math yourself. Look at the monthly amount due, but also multiply that amount by the number of years it’ll take to pay off. Then you’ll see the true cost of whatever you plan on buying. You might be okay with paying $300,000 for a house, for example, but would you be okay with paying more than $500,000? That’s how much you’d pay on a $300,000 mortgage with a fairly low 3.92% interest rate — unless you pay it off sooner than the 30-year term of the mortgage. Knowing the full cost of an item with interest can change your outlook on what you can “afford” — and that simply amounts to you making debt decisions you know you’re okay with, and avoiding the ones you’re not. No matter what else, make those monthly payments on time. Defaulted debt can lead to interest rate increases, a loss of properties if it’s used as collateral on a loan, massive amounts of late fees, and long-lasting damage to your credit scores. Just like a power tool, start using debt to your comfort level — not to the maximum of what it can do. As you become savvier over time, then you can step further in if you feel comfortable doing so. So, when you feel yourself getting caught up in the race to do the “correct” thing to do, take a breather. Any choices you make should be in service of your goals, not what anyone else is telling you that you need to do. If you keep the principles above in mind, then you’ll already be in a good position to manage debt and credit wisely. Beyond that foundation, trust yourself, make the choices that will aid in reaching your goals, and don’t worry about the rest.